What a pity the haven't tought about the adverts that get plastered over the sides of the buses, its going to half cover there lovely new logo. Am I the only one who feels it looks just like a red version of the Southampton UniLink livery? The new livery does look very smart, however, it seems to have taken away the company’s individuality, which I suppose is to be expected now they are part of the Go-Ahead Group. 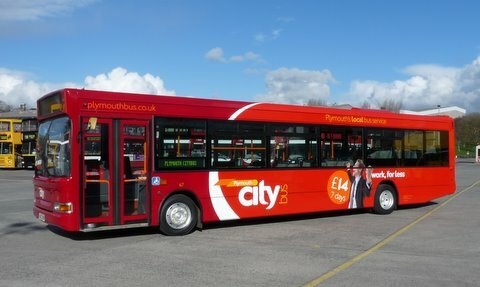 I wonder if all the branding was removed would it still be instantly recognisable as Plymouth CityBus? Wow a smart livery! A much improved livery over the typical corporation livery. I do feel that exterior advertising will be a thing of the past apart from overall adverts! Why should a bus market other companies' products over its own! Well done go-ahaed and still using Plymouth colours of red and white! So the livery somewhat resembles ONE of Go-Ahead's SIXTEEN other bus operations. It must be a conspiracy to introduce a corporate identity, I mean how dare two bus companies who've traditionally had red based liveries both end up with rebrands that shock horror, contain red?! Is it just me that thinks the new livery has introduced a new fleetname of City. 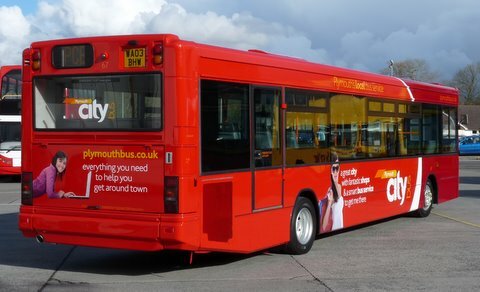 The "Plymouth" and "bus" almost seem an irrelevance to the livery! I like 'typical corporation liveries' at least then they look like a bus not a mobile boudoir! That said, it at least better than First and Stagecoach liveries even if uncannily similar to Oxford! One and a half cheers.